Perhaps it was inevitable: Minutes after Diana Nyad, the 64-year-old marathon swimmer, landed on the sandy shores of Key West, Fla., succeeding in her fifth attempt to swim the straits from Cuba, fellow swimmers unleashed a barrage of censure and doubt. Swimmers asked: Was she truly unaided during all those hours in the open sea, with only her crew observing? Based on her GPS data released by her team, how did she manage to swim nearly 53 hours, crossing 110 miles, given that her average speed was 1.7 miles per hour at the start and end of the swim? And were her two handpicked independent observers truly independent? 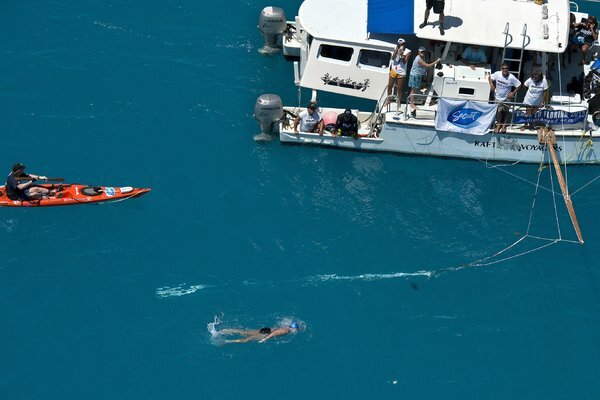 In the week since Nyad arrived in Key West to international acclaim, apparently becoming the first person to swim the 110-plus-mile route without a shark cage, doubters have multiplied. They have gathered on marathon swimming Web sites and other sites to criticize Nyad’s methods and her team’s transparency and to raise questions about the veracity of her claims. Nyad said she was not surprised by the questions and criticisms. “I’m an absolutely aboveboard person who never cheated on anything in my whole life,” Nyad said. “When someone does something they’ve been trying to do for a long time and you know how difficult it is, it’s only logical. I hope they’re not questioning if I’m an honest person. Her swim was not documented by independent news media, as were her previous attempts. Nyad acknowledged that the news media had wearied of the story because she had failed so often. Nor did members of Nyad’s crew take continuous video of the swim, a strange decision to some marathoners. “If I was doing a swim that had never been done before and everyone thought impossible, I’d have a video camera on me continuously,” said Evan Morrison, the San Francisco founder of Marathonswimmers.org, an online community of more than 700 athletes. But Steven Munatones, a former marathon swimmer and swimming official who has served on Nyad’s earlier crews, said he had no doubts. “I am 100 percent satisfied based on the GPS data, marine information, written information and personal interviews that she did the swim,” said Munatones, of Huntington Beach, Calif.
Munatones said he intended to review all the data from Nyad’s crew with a panel of other swimming experts, including the president of the Catalina Channel Swimming Federation, so they could answer all the questions being raised. The federation president, Forrest Nelson, said he had agreed. The biggest source of grousing pertains to Nyad’s speed and distance covered and the amount of push she got from the currents. Her previous attempts were undone by bad weather and uncooperative currents, which tend to sweep eastward toward the Bahamas. Nyad is a plodder; she says she averages less than 2 miles per hour. She swam at 1.7 m.p.h. when she left Cuba on Aug. 31 and again when she neared Key West. One marathon swimmer, Andrew Malinak of Seattle, used Firebug, a Web development tool that inspects code, to glean Nyad’s GPS data from the swimmer’s official Web site. He surmised that Nyad was traveling at an increasingly speedy clip on the swim’s second day — from 2 m.p.h. to more than 6 m.p.h. around 31 hours into the swim. After her crew made the data available with time stamps, Malinak revised his work and said that Nyad’s top speed was nearly 4.5 m.p.h. for a stretch. The pace was inconsistent, he said, with surges and then valleys, plunging her times to 2 m.p.h. “The rapid increase and two subsequent rapid decreases in her speed, combined with the already fast pace, still leave me skeptical of her swim’s authenticity,” said Malinak, a geotechnical engineer in Seattle, who has swum around Manhattan. Fellow swimmers have asked if it is possible that Nyad was on a boat when those surges happened. Nyad and some on board her flotilla said no. Her navigator, John Bartlett, a custom boat builder in the Florida Keys, says the fast water flows were predicted by a Connecticut physical oceanographer. Some of the fastest currents unfolded around noon on the swim’s second day, moving at 3.8 knots, close to 4 m.p.h. “They’re always that fast in the axis, the center of the flow,” said Bartlett, who crewed for Nyad on earlier attempts. The currents eased up to 1.4 knots on Day 3, but the direction was more northern, and thus more helpful to Nyad. Besides getting fair weather, with just a short squall to slow her, Nyad also benefited from great currents, which she hit at the ideal time, said Mitchell Roffer, a biological oceanographer and owner of Roffer’s Ocean Fishing Forecasting Service in West Melbourne, Fla. Roffer, who independently checked the currents after the swim when the criticisms mounted, said Nyad was swept along by a moving gyre, a large counterclockwise rotating current that moves from the Gulf of Mexico into the Keys, taking Nyad on a fast ride. It forms less than once a month, he said. Critics say the observers — typically people who have never met the athlete — are unknown in the swimming community, odd for such a high-profile event. Munatones was supposed to observe the swim. On earlier outings with Nyad, Munatones said he “did everything including getting sponsors, organizing the crew, blogging, and jumping in the water and helping feed her.” But when the team decided that the conditions were perfect, Munatones was on a plane to Tokyo. Nyad said she had to scramble to find two substitutes, both Key West locals who did not have a history of swimming or observing record crossings. One, Janet Hinkle, a licensed Key West boat captain, said she got the call at the last minute. She said she had met Nyad in 2011, providing her with a home to live in before a swim. Hinkle had never observed any swim, but she said she got tips from Munatones and said she was unbiased. “I believe she asked me because I would be an objective observer,” Hinkle said. She said she never observed Nyad getting on board the boat during the swim or being pulled by a craft. Nyad’s fans have called the critics “haters” who are jealous. Nyad has long been a lightning rod among swimmers who object to the publicity she seeks and the tactics she employs — like letting her crew remove her stinger suit and apply lotions. Many swimmers say those violate the most common rules of the sport, those followed by English Channel swimmers.